Illegal Guns Down Under, a Chilling Lesson for the U.S.A. 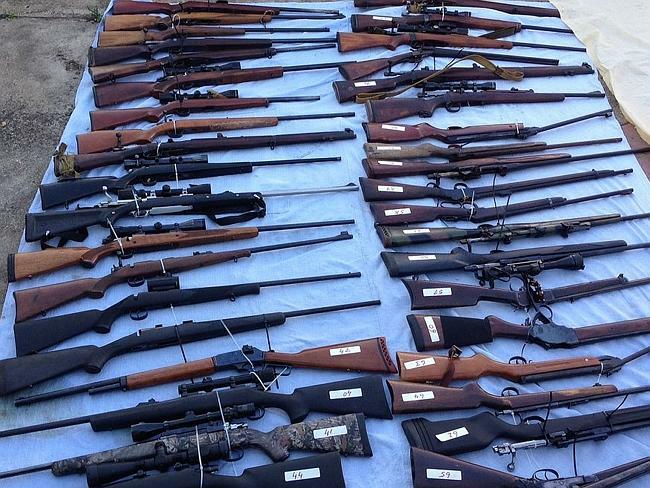 These guns and air rifles are being haled as a find of a massive cache of private guns in Moonford, Australia, a tiny farming community with virtually no crime. That is, there was no crime there before the National Australian government created it with the intrusive "gun control" law they passed, taking advantage of the act of a madman and the emotional response pushed by their national media. All guns must be registered. All guns must be locked up. All guns are subject to inspection at virtually any time. When I considered a trip to Australia a few years ago, I learned that even spear guns and blowguns are subject to restrictions. It is chilling confirmation that gun registration is gun confiscation. The "crime" here would not be any crime at all in the vast majority of the United States, and would not have been a crime in much of Australia before 1996. Notice that in the picture the "illegal guns" include pellet guns, single shot .22 rifles, antique shotguns, and numerous bolt action hunting rifles. A few of the firearms that were found might be restricted in the United States. The three men charged, a 69 year old father and two sons, aged 46 and 42, were licensed to have 71 firearms, and all those firearms are included in the 328 gun seizure. Because they are licensed to have guns, it is clear that they are not career criminals. It is not as if they can shoot more than maybe two guns at once. But because the guns *are not registered* they are all subject to being confiscated. Australia has done what the American anti-freedom advocates want: to make any possession of any gun not registered to the state a crime. All the guns in the country are then subject to seizure by the state at any time the state either 1)finds them (for those not registered) or 2)desires to take them (those already registered). The seizure of the guns included 4.2 tons of ammunition. Total value is likely to be hundreds of thousands of dollars. I wonder if Australian law will include confiscating the 2,000 acre farm. Until 1996, the federal government had little role in firearms law. Following the Port Arthur massacre, the Howard Government (1996–2007), with strong media and public support, introduced uniform gun laws with the cooperation of all the states, brought about through threats to Commonwealth funding arrangements (bold added). The then Prime Minister John Howard frequently referred to the USA to explain his opposition to civilian firearms ownership and use in Australia, stating that he did not want Australia to go "down the American path". In one interview on Sydney radio station 2GB he said, "We will find any means we can to further restrict them because I hate guns... ordinary citizens should not have weapons. We do not want the American disease imported into Australia." It is notable that the Federal Government used financial extortion to obtain the cooperation of the states. It is remarkably similar to what we have seen in the United States. Australia should serve as an object lesson to Americans. Their media and government so despised guns in private hands that they were quite willing to use "all means" to bring about the nationalization of the gun laws Australia now suffers under. The vast majority of Australians live in coastal cities and know only what they are told by the media about guns. Their ignorance has cost their country cousins much time, treasure, and police intrusion into their lives. Fortunately, the United States can learn from Australia's experience. We have far more activists who have developed strong networks to oppose these ill considered laws. Our urban populations are learning the truth about citizen disarmament laws. Australia's developing network of activists was simply overwhelmed by the combined media and government forces that conspired against them. If you or your family have ever visited an airport, courthouse, or even some hospitals and schools, you know that a metal detector can be the last line of defense between your loved ones and a criminal with a gun. But on December 9th, a relatively obscure but important law that prohibits the sale or shipment of firearms not detectable by a walk-through metal detector is set to expire. It's called the Undetectable Firearms Act and in the age of 3D printers that can produce a gun made almost entirely of plastic, it's imperative that Congress move to reauthorize the legislation. In the past Republicans and Democrats have come together to renew the law by simple voice votes. Even the NRA has agreed not to oppose the bill. Granted, perhaps the "agreed not to oppose the bill [bills, really--H.R. 1474 has an identical companion bill in the Senate, S. 1149, and as of Friday, Sen. Nelson introduced a second Senate bill, S. 1774, the text of which is not available, but is apparently intended to renew the ban for only one year]" should be taken with a grain of salt--there is of course nothing new about "gun control" groups lying--need a recent example? Also, the claim is not that the NRA is supporting the legislation, only that they will not oppose it--which at least makes them better than the National Shooting Sports Foundation. Still, the claim of NRA's avoidance of the issue can hardly be described as implausible. As for "not opposing" the legislation being better than actively supporting it--sure, marginally. By that standard, though, the American Lung Association could be called just as valuable a gun rights organization as the NRA--they don't seem to be supporting renewal of the "Undetectable Firearms Act," either. Combating the "No one Wants to Ban Guns Lie"
There are many people who advocate for bans on guns, but most of them are smart enough to know that the way to obtain such bans is incrementally, as has been done for the last 75 years. Why can't you walk down to the corner hardware store and buy a gun muffler for your pistol or rifle, like they do in Finland? A gun ban passed in 1934. Why can't you order military surplus rifles mail order, and have them delivered to your door, even though they are almost never used in crime? A gun ban passed in 1968. Why can't you pay the $200 tax, jump through the ridiculous hoops and interminable wait the BATFE requires to buy a newly made MP5, just like the police often carry, for the police price of $1,000, instead of the current U.S. legal price of $26,000? A gun ban in 1986. Why can't a Vietnam Vet, who 45 years ago signed a plea bargain about an argument with his wife, buy a shotgun to go hunting with his grandson? A gun ban passed in 1996. All of these laws are effective gun bans through the use of taxes, regulations, and the expansion of the classes of "prohibited possessors". Schakowsky: We’re on a roll now, and I think we’ve got to take the--you know, we’re gonna push as hard as we can and as far as we can. Mattera: So the assault weapons ban is just the beginning? Schakowsky: Oh absolutely. I mean, I’m against handguns. We have, in Illinois, the Council Against Handgun... something [Violence]. Yeah, I’m a member of that. So, absolutely. There are many more quotes floating around the Internet showing that quite a few people have advocated gun bans in the United States. The quotes on the lists that I have seen are all before the year 2000 for a reason: the would be gun banners learned that openly talking about a ban is bad for your political career. The best list of quotes that I have found was compiled by Eugene Volokh at gunscholar.org. In fact, the assault weapons ban will have no significant effect either on the crime rate or on personal security. Nonetheless, it is a good idea . . . . Its only real justification is not to reduce crime but to desensitize the public to the regulation of weapons in preparation for their ultimate confiscation. Charles Krauthammer (columnist), Disarm the Citizenry. But Not Yet, Washington Post, Apr. 5, 1996 (boldface added). It is the first on Professor Volokh's List, but there are dozens more. When some Internet commando of dubious intention indignantly proclaims: "No one wants to take your guns! ", just use the above sources to show how ignorant they are about the facts. Another great article by David Codrea. Go to Gun Rights Examiner for the whole article. 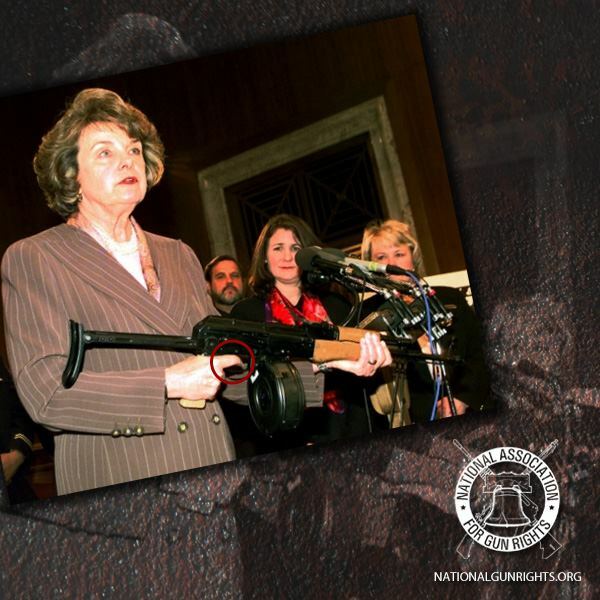 The so-called “nuclear option,” where the Senate voted to change filibuster rules on nominations, “was a vote to begin the process of effectively repealing the Second Amendment,” Gun Owners of America warned Monday in a member alert. And an analysis of that vote shows many Democrats given high ratings by the National Rifle Association helped to ram through what The Los Angeles Times has called “one of the most significant rule changes in Senate history” with no fear of political repercussions from the nation’s largest gun rights group. GOA’s assessment is corroborated by The Times’ report, which focused on recently-elected Democrats being the driving force behind the filibuster rule change, and cited Connecticut Senator Christopher S. Murphy’s reasons for pushing it through. "I was a proponent of filibuster reform coming into the Senate, but I became a revolutionary on this issue when we lost the gun bill," Murphy was quoted. But while Murphy is recognized by both NRA and GOA as a confirmed anti-gunner, a cadre of supposedly “pro-gun Democrats” putting party over principle cast the votes that enabled the radical change to pass. This is excerpted from the Buckeye Firearms Association Page, for wider dissemination. Editor's Note: Tactical Defense Institute's John Benner rarely weighs in on issues, leaving that function to others. When John addresses an issue it is noteworthy and well worth the read. This article was originally posted on the TDI Facebook page. Republished with permission. The official report from the Connecticut States Attorney's office on the Sandy Hook Elementary School massacre has been released. This horrific event has had a tremendous impact in many ways. My belief is the impact was so strong, not based on numbers killed, but the age of the 20 very young children murdered. The interesting and most important section of the report from my standpoint is the timeline of the event. Time is THE important factor in the taking of and hopefully saving of lives. The FASTER the killer is stopped, the less lives we lose. At TDI we believe without question (and have for a long time) in the arming of school staff (willing, trained and competent). Quite honestly, I considered that a pipe dream until the Sandy Hook Massacre took place. Everything changed, and we had to start asking the hard questions. What is a real answer, because law enforcement is not effective. After speaking with Jim Irvine and the Buckeye group we partnered with Buckeye Firearms Foundation to do classes specifically for school staff members. Buckeye named it FASTER, certainly a fitting name. I am not saying that law enforcement does not wish to do their job or will not do it - they are simply not there and the response takes way too long. The Sandy Hook report proves that once again. Police are investigating the shooting death of a man inside a duplex on the city's east side. Witnesses told police that a man arrived at the home and was let inside. An argument erupted between the man and the homeowner with the visitor shooting the homeowner in the chest. The homeowner returned fire, killing the man, police said. PALERMO — An intruder armed with a gun was shot by a homeowner Tuesday afternoon in Palermo, according to the Butte County Sheriff's Office. A recent story revealed that the Milwaukee is storing 11,000 confiscated guns in a facility in the city. Police Chief Ed Flynn engaged in a bit of hyperbole when he claimed that every gun was connected to a body. Milwaukee has had 1,515 murders from 1999 to present, over the last 14 years. As guns are used in about two thirds of murders, Chief Flynn would have to be hoarding all guns connected to murder in the entire State since Wisconsin entered the Union in 1848 for each one to be "attached to a body". It is possible that Milwaukee police violate families' property rights when a suicide occurs, and confiscate those guns as well. Milwaukee has about the same number of suicides as it does homicides in a year, so that would chop the number of years required by half, back to only the beginning of the depression. Flynn used the photo-op to push for one of his favorite old failed policies, gun control. However, he was unable to connect any one of the confiscated guns to a murder involving someone with a concealed carry permit, because there haven't been any since the permit system was established in 2011. This is not surprising, as Minnesota has only had three in the nine years that they have records for their permit system. After two years, Wisconsin has over 200,000 permits, which beats Minnesota's 150,000. Milwaukee, with a population of about 600,000, accounts for 60 percent of Wisconsin murders. Wisconsin has population of 5,726,000. 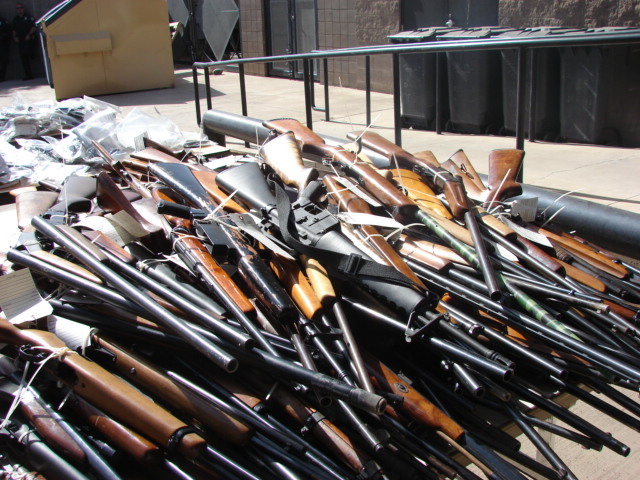 So where did all the 11,000 confiscated guns come from? A good number likely came from widows who turned in their former husband's deer rifle to the police, not knowing it is now an antique and worth a thousand bucks. Many likely came from traffic stops where police bullied someone into giving them their firearm under fear of prosecution, from divorced men or women whose partner filed a restraining order against them as part of divorce lawyer tactics, and from people who were arrested for possessing marijuana. The Milwaukee PD has a reputation for being hostile to armed citizens. Milwaukee pastors have been hunting for money to do a gun turn in initiative, but Milwaukee is short of money. There is a simple solution to please nearly everyone. Sell the confiscated guns to dealers. 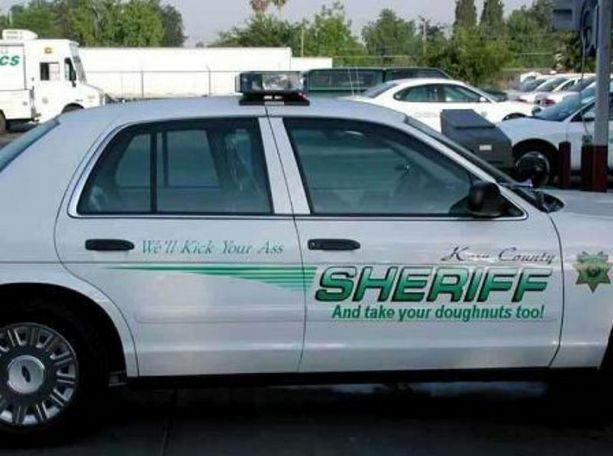 That would get them "off the streets" and into responsible hands. I am sure that there are avid hunters who would love to have the scoped Ruger Super Redhawk (worth about $800) that Chief Flynn handled, or the the Smith & Wesson magnum, well suited for deer hunting, worth about $600, that he showed. The guns would all go through the background check system. The sale would bring in a couple of million dollars. If you think the turn in events do any good, put the money into a revolving fund to fund the turn in (erroneously called buy back) event in Milwaukee's crime ridden neighborhoods. Collect another group of guns in these events. Sell them to dealers, just like you did the first group, and use the money to replenish the revolving fund. Have turn in events every six months, if you like. In effect, you will be taking guns out of the city, where the crime is, and putting them into the suburbs and country, where they are not a problem. Everybody wins. To be fair to Chief Flynn, he is just another police politician imported from Massachusetts to be liberal enough for the Milwaukee City Council. All his life he has been fed false "facts" about guns and gun control. A person does not change the world view that they grew up with easily. State law covers the disposition of confiscated firearms, which have to be turned over to one of the two State Crime Labs. The one in Milwaukee is probably where the 11,000 guns are stored. If the State wants to use these assets wisely, they could pass a common sense law like Arizona did. The truth is that gun "buybacks" have no measurable effect on crime, so the couple of million bucks for the guns could go just about anywhere. But spending money to maintain a storage facility for 11,000 guns, when putting them on the market would reduce record high demand for new guns, and put money into the public treasury, is just common sense. Investigators in Connecticut released a report yesterday concerning the December 2011 murders in Newtown. It says the shooter was "obsessed" with mass murders. During their search of the (redacted) home, law-enforcement officials found a spreadsheet that tracked mass murders over the years, including the names of the assailants and information about each incident. They also found a "large amount of materials relating to Columbine shootings" as well as a "computer game titled 'School Shooting' where the player controls a character who enters a school and shoots at students" and "commercial movies depicting mass shootings," the report said. Stephen Sedensky III, state's attorney for the Judicial District of Danbury, CT, who led the investigation said they may never conclusively know the killer's motivation "despite the collection of extensive background information on the shooter through a multitude of interviews and other sources." However, the shooter's obsession with mass murders in general and Columbine in particular serves to prove Ari Schulman's contention that the media-driven publicity of these killings only serves to feed the next killer. HIGHLAND HEIGHTS, Ohio -- City Council tonight will consider repealing a resolution that prohibits carrying loaded weapons within city limits. The current legislation, which is more than 50 years old, contradicts an Ohio law that prevents cities and other local governments from enforcing ordinances more restrictive than state gun laws. Parma and Oberlin took similar steps recently to lift bans on guns in city parks. Emily Miller is right about the Schumer scam. She is wrong about 3D printed guns. The ban does nothing to make us safer, but it does impede technological development and create another victimless crime. The federal ban on plastic guns will expire on Dec. 9 if the Senate Democrats keep trying to trick Congress into more gun control. Once the law sunsets, anyone with a 3D printer and downloaded blueprints can make a legal gun that can pass through metal detectors. This is dangerous for everyone. Just before the Senate recessed last Thursday for two weeks, Sen. Chuck Schumer abruptly called for unanimous consent for a one-year extension to the Undetectable Firearms Act. Up to that point, all discussion in both the House and Senate were for five or 10 year periods. His scam was to have the bill expire again during the Senate’s lame duck session in 2014. At that point, Mr. Schumer and his compadres could tack on the gun-control expansions that their vulnerable Democrats in rural and western states would not support in an election year. A six-member panel charged with providing recommendations on Capitol security to lawmakers, led by Lt. Gov. Yvonne Prettner Solon, deadlocked 2-2 on the proposal that would have included permit holders in the Capitol’s firearms ban. Minnesota Supreme Court Chief Justice Lorie Gildea, a panel member, excused herself from voting in case the issue comes before the high court. Sen. Ann Rest, DFL-New Hope, was out of state. The panel was made up of two Republicans and two DFLers, as well as Prettner Solon and Gildea. During Tuesday’s debate, both sides accused the other of playing politics with constitutional rights. Sen. Bill Ingebrigtsen, R-Alexandria, said an extension of the ban was unnecessary. It appears that the open carry tactics are working. Here is some history on how Texas, of all places, came to ban the open carry of handguns. For years, supporters of open-carry gun laws have pleaded with lawmakers to allow Texans to bear their arms openly in public. With the front-running Republican gubernatorial candidate proposing open carry laws, many supporters believe the time has finally arrived for legislators to approve such a measure. "I think open carry will be the Second Amendment issue this next session, and I do think that we can pass it because the support is just tremendous," said state Rep. George Lavender, R-Texarkana, who introduced open-carry legislation that failed earlier this year. HOUSTON –- Police said three teens who broke into a northwest Houston home overnight were greeted by a homeowner with a gun. Houston police said one of the teens went into the home through the garage, and a barking dog woke up the homeowners. The homeowner got his gun and managed to hold one of the suspects while waiting for police to arrive. The two sides of the issue are firmly entrenched. The New York Secure Ammunition and Firearms Enforcement Act, or NY S.A.F.E. Act, was quickly approved by the State legislature in January following the shootings at the Sandy Hook Elementary School in Connecticut. When Anita Ingrao and I started to create Assaulted: Civil Rights Under Fire, it was to be produced for local television and not a feature-length film. We never intended to take on the history of the 2nd Amendment and the debate on guns in our society, but our production timeline intersected with the tragic events of Aurora and Newtown shootings. The emotional reactions of the media and those by government officials surrounding events directly related to mental health problems illustrated the need for a logical, fact-based film on guns in America. The genesis of the film came during the production of a regional film dealing with the problem of urban street gangs invading rural California. I was doing ride-alongs with our local Sheriff’s anti-gang unit when we came in contact with a gang member who really didn’t like being filmed. After the encounter, the deputy asked if I had a concealed carry permit (CCW) and I told him I didn’t and he responded that I should consider getting one for my own safety. Over the course of obtaining my permit, I learned that not all Californians are equal in the eyes of the law. Residences of rural counties can easily obtain their CCWs, however, those of urban areas like San Francisco, San Diego and Los Angeles cannot. The issuance of CCWs on a county-by-county basis at the discretion of the individual sheriffs just sits wrong with everything I believe is fair and right. How can a single mother that is trying to protect her children and her home in East LA have fewer rights than a rice farmer in Northern California? The law should be allowed to lapse. It does not serve any useful purpose, and stifles technological advancement. David Codrea writes about the eager way in which the NSSF is willing to throw the second amendment under the bus on this issue. The federal law banning undetectable plastic guns expires in two weeks and Congress is on a Thanksgiving vacation, making it likely the law will lapse — and opening up at least a temporary problem. Gun control proponents say the search for a solution is even more urgent with the expanding capabilities of 3-D printers, which can manufacture plastic guns that can be untraceable through traditional means. Racing the Dec. 9 deadline, Senate Democrats tried to speed through a bill last week keeping the ban in place, but a Republican objected, arguing the legislation had just been introduced hours before the chamber was scheduled to leave town. That objection halted the bill. The State Department in May ordered Texas-based Defense Distributed to take down a 3-D gun model, called the “Liberator,” from its website. Mr. Schumer’s office said Monday there’s still a chance to pass the renewal since the Senate convenes on the day the act expires, but if it does lapse, they will continue working to get an agreement to advance legislation as quickly as possible. Federal law also says that gun parts and components must appear clearly when examined by X-ray machines commonly found in airports. The act was first passed by Congress and signed by President Reagan in 1988 and has been renewed twice since then — once under President Clinton and once under President George W. Bush. The Supreme Court turns down most of the cases appealed to them. I do not hold out much hope for this one, no matter that it has tremendous merit. The Commerce Clause has been morphed by "progressive" judges from a check on State power to a license for unbridled federal power. "Our lawsuit is designed to challenge the federal Commerce Clause power," Marbut said. "That is, the power given to Congress in the Constitution to regulate commerce among the state's, which has been construed to allow the federal government to prohibit any economic activity within state. And we think that that's a transgression." The high court may say early next year whether it will hear the case. With the passage of Act 746, Arkansas became a constitutional carry state. However, many people, most prominently Democrat Attorney General McDaniel, have been reluctant to recognize that fact. Second amendment activist groups have been organizing open carry events around the State to educate the public about their rights under the State and Federal constitutions. The latest of these open carry walks occurred in Springdale this last Saturday. The event was attended by about 50 activists, a considerable number for a town of 73,000 people, when you consider that at the height of the anti-second amendment hysteria this year, the "Stop the NRA" event in Washington, D.C. only drew approximately as many in a city of 623,000. This YouTube slide show shows how the constitutional supporters are educating the public about the restoration of their rights. These activities are gradually percolating through the local media and educating everyone about the law. As with most states, Ohio pre-empts local governments from enacting gun ordinances that are stricter than state law. To allow such laws would make the exercise of second amendment rights a legal minefield, as it would be practically impossible to keep up with hundreds of variations in the law that could make a perfectly legal act on one side of the street a serious crime on the other side. Cleveland challenged the law in 2010, claiming that "home rule" prevented the state from restraining the cities power. The Ohio supreme court upheld earlier rulings in favor of state authority to protect second amendment and state constitutional rights. Many local governments continued to keep laws that infringed on second amendment rights on the books, producing a chilling effect on the exercise of those rights. A provision in the statute provided for the recovery of costs and attorney's fees when cities were sued, to provide incentive for them to follow the law. Several cities changed their local ordinances as a result. But some cities learned to exercise a loophole in the law in order to discourage further lawsuits. They refused to change the law, fighting the effort in court until the last minute, wasting city resources and costing those challenging their illegal practices as much money as possible. Then, before a court ruling was made, they would repeal the statute, preventing the plaintiff from recouping any costs or attorney's fees. As part of a number of reforms Ohio gun laws proposed in House Bill 203, the bill would change to law to close this loophole. Once sued, cities would be subject to a $100 a day fee if they lost the lawsuit or repealed the ordinance. While $100 a day is only a fraction of the cost of one city worker per day, it provides some reimbursement of the costs of funding the lawsuit and provides an incentive to prevent the city from delaying the action as long as possible. Other reforms included in House Bill 203 include reform of Ohio self defense law to bring it into concurrence with most other states (Stand Your Ground provision), and reforms of the Ohio Concealed Carry permit law. An anti-freedom policy has been spreading across United States police departments, the legalized theft of citizens guns. Recently, it occurred in Georgia. I am not talking about forfeiture laws. They are related but have been covered elsewhere. This is a problem in many urban areas, and it is spreading. The policy is to impound guns, in extreme cases, all guns that officers come across, whether involved in any crime or not, then to refuse to return the guns until a judge issues an order to return them. As the attorney fees needed to obtain a court order can easily be 10 times what the gun is worth, most people do not bother. It is a form of legalized theft. I first learned of this policy from students who were or who had lived in California. I had numerous students who had dealings with the LAPD. I started hearing stories about how guns were seized, even if there were no crime involved. If an officer came across a gun, it was seized, and it would not be returned until the LAPD received a court order demanding that it be returned. As hiring a lawyer to obtain a court order could easily cost thousands of dollars, very few people even tried. I also heard that some judges, who had a personal animus toward firearms ownership, simply refused to grant an order. Here is a case related by a student: The student was stopped for a routine traffic stop. While stopped, the officer asked him if he had any guns in the vehicle. The student replied that he had rifles locked in the tool box that was attached to the bed of the pick up truck. The officer demanded that the student open the tool box, which he did. The officer then confiscated the rifles. The student was never charged with a crime, but the police refused to return the rifles unless they received a court order ordering them to do so. This reverses the presumption of innocence and the presumption of ownership that goes with possession of an item. In 2005, a California law was passed requiring people who had firearms impounded by police to fill out forms sent to the State government, and be certified as being eligible to legally own a firearm by letter, before the firearm can be returned. Even with this state imposed certification, many departments are still requiring a court order before they will return lawfully owned property. SAF and Calguns settled a lawsuit against Oakland and San Francisco for refusing to return firearms. Cleveland recently settled a case where they refused to return a firearm to the lawful owner. In Arizona, a reform was passed to require issuance of a receipt in firearm seizures. In Wisconsin there have been a number of settlements where guns have been returned, often with a cash settlement to cover lawyers fees, although these were primarily for illegal arrests involving firearms carry. I have been told that police are reluctant to return guns because they fear liability if the firearm is subsequently used in a crime. While this is an extremely rare occurrence, it is easy to see how police might use this excuse to fail to take appropriate action. One remedy is to educate the police as to their liability if they *fail* to return property to its legal owner. The lawsuits mentioned above are useful for that purpose. Often, a letter from an attorney, threatening legal action, can spark a desired response. Once, I was able to obtain the return of a firearm simply by showing up at the crime lab and asking about its disposition. I was asked if I was a lawyer. I noncommittally said that I had studied the law. I was immediately told that the firearm would be returned (and it was). Another solution is public awareness. Policies can be changed more easily than legislation. Public pressure and lawsuit settlements can result in a change of polices. If your firearm is seized or impounded, insist on a receipt, then follow up with documented requests for the return of the firearm. Inform activists groups of the situation. This may lead to pro-bono legal action or necessary funding for the same. I have encountered officers who think that impounding firearms and making their return difficult somehow "gets guns off the streets" and makes crime less likely. The passage of laws that mandate the return of firearms to legal owners and the sale, rather than destruction, of "found" firearms helps to short circuit that assumption. It reinforces the fact that firearms possession is a constitutionally protected right. This is primarily a problem of police policy and attitudes. Most court actions result in the firearm being returned. The difficulty is that the owner should never have been forced to go through the legal process to have his property returned in the first place, or the firearm should never have been impounded to begin with. The conversion of police thinking about firearms from "contraband" to "constitutionally protected property" is what is needed to stop this form of legalized theft. The clerk had the presence of mind to arm themselves after they had been wounded. It is not uncommon for criminals to leave an area and return. The armed robber shot the store owner in the leg before all the money had been handed over. Authorities say the gunman then walked outside and returned to get the rest of the cash, but by that time the owner had managed to get a gun. When the gunman approached, the owner shot the robber at least 11 times. Basic knowledge and familiarity with firearms will enable most people to tell most fake guns from real ones, if they are within a few feet of the object. The clerk recognized that the gun the suspects were using was a fake, so he reached down and brought his own gun up, telling the would be robbers that his gun was “bigger”. The suspects ran out of the store, and quickly left in their getaway car. Very little information about this shooting. Perhaps we will find an update later. Police say a Shiloh man shot a would be home intruder in the face late Thursday night. It continues to surprise me that so many of our local politicians have decided to oppose our second amendment rights. After the passage of House Bill 2 and its court battle there seems to be a never-ending line of local politicians willing to limit their citizens freedom. Many of these local politicians are people who consider themselves politically conservative but they have fallen prey to the fear tactics of those who want to destroy our freedoms. I’m convinced many are just pawns and have no idea what they are doing, they are so fearful for their political power and position that they are easily persuaded. Others may not be as conservative as we’ve been lead to believe. One local politician who stood up for the rights of citizens is Mr. Charlie Box, of Columbus, MS. He was the only councilman who voted against Columbus’ recent attack on citizen’s rights. Councilman Box said, ”I can’t in good conscience vote for anything that limits the Second Amendment rights of the citizens of Columbus and the United States,” . Thank you Mr. Box. This Article is the first scholarly analysis of knives and the Second Amendment. Under the Supreme Court’s standard in District of Columbia v. Heller, knives are Second Amendment “arms” because they are “typically possessed by law-abiding citizens for lawful purposes,” including self-defense. The Twin Cities Gun Owners and Crucible Arms has put together a great video showing regular people around Minneapolis and St. Paul,Minnesota in their “natural habitat” exercising their 2nd Amendment Right. We need more videos like this to help educate people who don’t own guns. We need to let them know that everyday people carry guns… and that’s OK. This video is 2 minutes and 35 seconds long. Well worth watching. Armed citzens sometimes lose the fight. Anderson County Coroner Greg Shore said Dorothy Hendrix was shot to death at her home early Saturday morning. Shore said Hendrix came home to find three men outside her house and became involved in a gunfight with them. "She fought. She was a fighter. She shot him," Lollis said. Investigators said deputies found Hendrix dead and a man with a gunshot wound to the stomach across the street from her home. Philadelphia has flouted the rule of law by banning the non-existent threat of 3D printed guns. The problem is that Philadelphia's preemption was already preempted by the state preemption law. It is not as though the Philadelphia law serves any useful purpose, other than to draw attention to the city council's lawlessness. It takes a lot of chutzpah to expect people to follow a law that breaks the law. 3D printed guns are useful, in that they point out the ease with which guns are made at home, as they have been for the last 1500 years. It appears that 3D printers somehow connect with today's politicians. They understand that computers and printers exist. They have actually used them. And, it is understandable that they have no understanding of how easy it is to make guns. They have likely never used a file or drill or hammer, let alone a welder or lathe. Even in the 1970's about 20% of the guns confiscated in the District of Columbia where home manufactured. 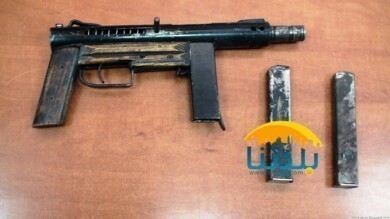 Homemade guns are even made in prison. There may not be as many homemade guns in Philadelphia, because ordinary guns are very common in Pennsylvania, function very well, and are protected by the State and Federal constitutions. What has happened here is a simple example of why Philadelphia is going broke and has a high crime rate. Having a city council that does not care about the rule of law, does not understand reality, and likes to engage in political grandstanding, explains those problems rather well. Do not run at a man with a gun who tells you to stop. The armed homeowner is 69 years old. Having two teens run at him while he is armed shows disparity of force. If the teens had reached him, they could have disarmed him and killed him. Young, multiple attackers have killed many with only hands and feet. RINGGOLD, Ga. — It's now more clear how 17-year-old Dalton McConathy wound up dead Monday afternoon, shot, police say, by 69-year-old Fred Steven Youngblood outside Youngblood's Post Oak Road home. Prior to this week, the Stones' only interaction with Youngblood was after their dogs went into his yard, and he shot at them. Her husband went to talk to him. "He said 'That was a warning. Next time, I won't miss,'" Stone said. But, she added, according to Catoosa County property laws, "he had every legal right to do that." According to the initial Catoosa County Sheriff's Office report, Youngblood heard two of the teens in his home, grabbed his pistol and went to confront them. He reportedly went to the back of the house and told the two male teens to "stay still." But "they ran towards him and he shot at them," the report stated. RINGGOLD, Ga. — Two teens are in custody and another is dead after police say their attempted burglary went wrong in Ringgold. Youngblood was standing outside the home and yelled at the boys to get out, the sheriff said. One poked his head out of the house and then both ran toward the 69-year-old, who said he feared for his life. The man shot 17-year-old Dalton Mcconathy in the side of the neck, Sisk said. After they fled, Mcconathy collapsed into the bed of the truck. He later died at a hospital. The Firearms Coalition has provided an alert about the proposed BATFE Obama administration rules. The proposed rules make the application for trusts and companies to obtain federal tax stamps for gun mufflers (silencers, suppressors), short barreled rifles and shotguns, full-auto guns and a few other items, considerably more convoluted. The Firearms Coaliton supplied a sample comment in the article on ammoland to use as reference for comments, which can be made here. I found the proposed rule change comment section with a search for NFA trust at that link, and by clicking on the Comment Now button on the right side. After reviewing the Firearm Coalition comment, I decided to write my own. Feel free to use it or to take points from it as you choose. These proposals attempt to provide solutions for problems that are non-existent. The existing problem with the regulations is that they are non-responsive, result in unreasonable waiting times, and create barriers to good safety practice. I have not heard of a single example of criminal misuse of these items that resulted from NFA trusts or companies. The excessive federal regulation on gun mufflers, suppressors or silencers, has caused millions of people to have substantial hearing loss, a federally mandated health disaster. The regulations on short barreled rifles and shotguns, given the Supreme Court decisions in Heller and McDonald, no longer make any rational sense. To make them even more intrusive and complex is bad policy, on the edge of irrationality. The BATFE currently handles the annual caseload of about 30,000 transactions poorly, with delays of six to nine months. Instead of potentially doubling this caseload for frivolous political reasons, the administration should be looking to eliminate the requirement for these intrusive and unnecessary checks on items that are treated no differently than common firearms or accessories in many European nations. In Finland, for example, gun mufflers, suppressors or silencers are considered a constitutional right. No crime problems have resulted from this. Short barreled rifles and shotguns are functionally no different than handguns, possession of which has been ruled to be a constitutional right in the United States. They should be treated the same as handguns. If these actions were approved, the wait times for other applications could be handled in a timely manner. The current Chief Law Enforcement Officer certification requirement should be done away with completely. At present, local officials are able to stop individuals from obtaining federal licenses based on nothing by individual bias, discrimination, an unwillingness to process the forms, or simple caprice, without any appeal. The proposed rule changes would extend this affront to the rule of law to trusts and companies as well. The citizens that apply for these "tax stamps", which are in fact, poorly disguised licenses, have been shown to be the most law abiding of the top 10 percent of the country. They should not be punished for the remarkable safety record that they have established. There is no rational basis to make these regulations more restrictive. After submitting the comment, you will be given a tracking number to track it through the system. My tracking number is: 1jx-88wl-w71t. When we push to remove these frivolous infringements on the second amendment, we will be able to show that they were opposed by large numbers of commenters, but only if we bother to make a comment. Comments close on December 9th, so now is a good time to get your comment in the system. The Glock pistol was the first gun that anti-rights types claimed was "undetectable" The KelTec P3AT is one of the new breed of small concealed carry guns that is extremely light and popular. Both guns use composite frames. The ban on "undetectable" guns is set to end on December 9th. This ban should be opposed on principle. It does nothing to add to the false security provided by metal detectors. The guns are detectable, of course, just not detectable on metal detectors with a high setting. If a detector cannot detect an "undetectable gun" or a cartridge, it cannot detect a bomb or plastic bags of gasoline. The ban stifles technological innovation and promotes the discredited idea that a disarmed population is safer than an armed one. We did not even have metal detectors a hundred years ago, and we had lower murder rates than we do now. Promoting the idea that all of society should be changed to make fortified zones a tiny bit less likely to be penetrated is a failed approach to public safety. Pro-gun-control Democrats in the Senate are angry with Sen. Jeff Sessions (R-Ala.) for blocking reauthorization of a law that would ban 3-D printable guns that lack metal parts. Sens. Chuck Schumer (D-N.Y.) and Richard Blumenthal (D-Conn.) tried to bring up the Undetectable Firearms Act on Thursday evening. The law, which passed in 1988, bans guns that can’t be spotted by metal detectors. The last reauthorization, in 2003, passed both chambers of Congress unanimously. It sunsets on Dec. 9. Why should Republicans give this up without something in return? If the Democrats want it so badly, then they should be made to give up something for it. That is the nature of real compromise. The Republicans should couple a renewal of the ban on false "undetectable" guns with a removal of the federal tax and regulation of short barreled rifles, for example, or national concealed carry reciprocity, or eliminating the ban on carrying weapons on Corps of Engineers land. Any of these would do, and would be relatively uncontroversial. Practical experience has convinced skeptics that ordinary people can be trusted with carrying lethal weapons. They go from skeptical, to neutral, to becoming supporters. This is the typical progression for a person who is willing to be convinced by facts. Most people can change their mind about an issue if it does not challenge their basic assumptions about reality, because that threatens their very identity. The assumptions of the "Blood in the Streets" anti-rights groups are those of the "progressive elite" model of modern murder. In that model, murder occurs when an ordinary citizen flies into a rage, and has access to a gun or other lethal weapon. The success of the shall issue CCW programs, which allow 95% of society to carry lethal weapons with them if they choose to, discredits that model. If that model were accurate, murder rates by CCW holders would be higher than that of the general public. Instead, they are much lower. They are even much lower than murder rates for police officers. LIMA — When Ohio first licensed citizens to carry a concealed handgun nearly 10 years ago, then U.S. Sen. Mike DeWine was a little skeptical. Crish also is hearing from a lot of people who opposed allowing citizens the right to carry concealed handguns but now support it, he said. The people who cannot accept this are those who have invested part of their identity in the discredited "Progressive elite" model. It is extremely hard for an adult to change their basic assumptions about reality. It hardly ever happens because of a rational presentation of evidence. Fortunately, in this case, such people are a small percentage of the population. Unfortunately, they are vastly overrepresented in academia, the old media, and in "progressive" circles generally. One of the credos of the far left is "The Masses are Asses", which is a fair representation of the "Progressive elite" model. Disprove that assertion, and you threaten their identity, so they tenaciously cling to the position, despite all evidence to the contrary. Update: Michael Barone explains that he went through the process listed above in this Washington Examiner Article. Reports have been surfacing for days across the country, including yesterday’s story in Philadelphia, and another in Washington, D.C., about the so-called “Knockout Game” in which thugs have targeted people, frequently women, at random and attempted to knock them unconscious with a single punch. Disarmed victim zones (aka gun free zones) do nothing to stop crime, but do disrupt the lives of people who are willing to take the expensive and responsible step of arming themselves in order to prevent crime. CADL enacted a firearms ban in 2011 at its branches only to have the Michigan Court of Appeals strike it down last year. Public libraries are not included in Michigan's "gun-free zones," and both concealed and open firearms are allowed. The news does not tell you that verterans are more law abiding than the general population. They also are trained in the use of arms and understand the necessity of deadly force. A commenter says that the police impounded the veteran's gun. This is a good reason to have a spare, or know a friend who will lend you a defensive weapon when you need one. A 69-year-old west Columbus man said he defended himself, his partner and his home from robbers. "They turned their gun on me and when they did that I just stood up and shot," he said. "I honestly felt that I would have gotten killed. He would have gotten killed … And I wasn't going to let it happen." Columbus police said one of the gunshots struck the suspect in the neck. Police said another shot struck another suspect in the chest. "My adrenaline started going. I said, 'Well, it's either kill or be killed.' That's the way I looked at it just like we had to look at it in Vietnam. I had to protect our house," the victim said. She might not have been injured if she had the gun with her, instead of having to fight to get free to get her gun. An elderly Midland woman was injured Thursday night (Nov. 21) after fighting off a pair of home invaders, according to the Sebastian County Sheriff’s Office. Two men wearing ski masks, black gloves and camouflage clothing entered the woman’s home on Drake Loop near Highway 253 looking for prescription medication, according Sgt. Steve Cox. Authorities said the door to home was not locked. The sheriff’s office said one of the men grabbed the woman and tore the collar of her shirt. She ran to the bedroom and grabbed a pistol, according to authorities. The suspect threw the woman to the bed and got on top of her. The woman pointed her pistol at the man and both men took off with her medications, according to the sheriff’s office. One of the largest groups of new gun owners are women. Those who push citizen disarmament know that they cannot win if a substantial number of women become gun owners and freedom activists. KINGSLEY -- The number of people applying for concealed pistol licenses has taken off in the past few years, and many of those who are arming themselves are women. Thousands of women in Michigan are choosing to carry a firearm. You would never know Tracy Romzek from Buckley grew up afraid of guns, but she confessed it was a fear of the unknown. “I was scared of them! I was very scared of guns,” explained Romzek. “Guns kill. That's kind of the mindset I had before. I think it's really important. There are so many of us that are afraid of guns because we're not around them. In the past year alone, Romzek has gone from never holding a gun, to taking a course to get her concealed pistol license, or CPL. Kurt shows how silly the VPC claims are. It shows the leftist roots of the argument that they feel compelled to use discredited Marxist economic theory to explain why the NRA exists and what its motivations are. The group's executive director Josh Sugarmann has written several Huffington Post opinion pieces on just that subject: "NRA, Board Members, Have Financial Stake in Stopping Ban on High-Cap Magazines," "NRA Receives Millions from Gun Industry 'Corporate Partners,'" "NRA Reaps Profits From the Internet Ammo Sales It Made Possible." And let us not forget: "Trayvon Martin: Victim of NRA/Gun Industry Marketing of Concealed Carry," "NRA’s Long-Running Opposition to Regulation of Common Explosives Threatens Public Safety While Benefiting Its Gun Industry 'Corporate Partners' New VPC Report Reveals" and "NRA Meets in Houston to Promote Gun Industry's 'Latest and Greatest Products'." The report, Blood Money: How the Gun Industry Bankrolls the NRA, reveals that since 2005 contributions from gun industry "corporate partners" to the NRA total between $14.7 million and $38.9 million. Hmm--"between $14.7 million and $38.9 million"--not a whole lot of precision there. And, of course, no mention of how much of the NRA's income came from members. Universal Coin & Bullion is one of the NRA's top "corporate partners" and a member of the "NRA Business Alliance." It has given between $500,000 and $999,999 to the organization. One could point out the hypocrisy of a "gun control" advocate accusing the NRA and friends of "exploit[ing] JFK death," but wait a second--what does Universal Coin & Bullion have to do with firearms? How can such a company profit from the defeat of draconian "gun control"? And wait another second--what's this from Sugarmann? Moms Demand Action caught lying… Again!